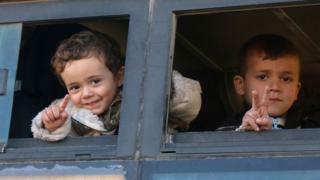 Aleppo battle: What next for the evacuees? Thousands of people have been leaving besieged, rebel-held eastern districts of the Syrian city of Aleppo following the resumption of evacuations agreed as part of a ceasefire deal last week. Most are being transported to rebel-held Idlib province, where aid groups say conditions are inadequate, with insufficient food and medical supplies. The International Committee of the Red Cross, whose staff are assisting the operation, said on Tuesday that 25,000 rebel fighters and civilians had been evacuated since the operation got under way. As many as 25,000 others could be waiting to leave in freezing conditions. Last Thursday, UN special envoy Staffan de Mistura estimated that some 50,000 people, among them 40,000 civilians, were trapped inside the four of five districts still under rebel control, which together cover about 2.6 sq km (1 sq mile). As part of the ceasefire deal, 750 people have been evacuated simultaneously from two Shia towns in Idlib province that are under siege by rebel forces - Foah and Kefraya. The UN Security Council has meanwhile approved the deployment of 20 observers to Aleppo to monitor the treatment of civilians as pro-government forces assume complete control of the rebel enclave. More than 70,000 people have also fled on foot to government-controlled areas since mid-November, when government forces stepped up their assault. Where are the evacuees going? The UN said on Tuesday that its aid partners had counted 19,000 evacuees arriving in Idlib province, a rebel stronghold. Many have been taken to temporary camps while others have found shelter with relatives. The World Health Organization separately said on Tuesday that 301 injured and sick patients, including 67 children, had been taken by ambulances to eight different hospitals in the western Aleppo countryside and Idlib province. The WHO says 93 patients had subsequently been referred to hospitals in Turkey, which backs the rebels and helped negotiate the ceasefire deal with Russia. Turkey, which is home to some 2.7 million Syrian refugees, is also preparing to set up a "tent city" in Idlib to accommodate up to 80,000 displaced people from Aleppo. Three possible sites have reportedly been identified, and hundreds of aid lorries from the Turkish Red Crescent and the Humanitarian Relief Foundation (IHH) charity have crossed the border. A smaller camp for 1,000 "disadvantaged" evacuees from Aleppo - the injured and disabled - will be set up in the Turkish border town of Reyhanli. What are conditions like in Idlib? In many places, conditions are already inadequate, with families staying in crowded buildings still under construction with no heat, toilets or running water, the International Rescue Committee (IRC) says. And villages in the countryside are said to be getting full. A doctor who is volunteering at a makeshift hospital in Idlib said there was no equipment to monitor patients. "Even the Intensive Care Unit doesn't have a ventilator," he said in a video posted on Facebook. Idlib already hosts some 230,000 displaced people in and around 250 informal camps, according to the IRC. Will they be safe in Idlib? Aid agencies have raised concerns over the security of those in Idlib. Most of the province is controlled by a powerful rebel alliance that includes the jihadist group Jabhat Fateh al-Sham, which was known as al-Nusra Front until it announced it was breaking off formal ties with al-Qaeda in July 2016. The province has been repeatedly bombed by the Syrian and Russian air forces, and President Bashar al-Assad has said it will be one of the next areas to be "liberated" after Aleppo. Staffan de Mistura, the UN envoy, warned on Friday: "If there is no political agreement and a ceasefire, Idlib will become the next Aleppo." What is happening in Foah and Kefraya? Some 20,000 people are living in the two predominantly Shia towns, located just to the north of the city of Idlib, which have been under siege by rebel and jihadist fighters since March 2015. Pro-government fighters who were evacuated a year ago reported that starving residents had resorted to eating grass, and that injured people had undergone surgery without anaesthesia. The fates of the residents of Foah and Kefraya have previously been tied to those living in two mainly Sunni towns besieged by pro-government forces outside Damascus - Zabadani and Madaya. Several simultaneous evacuations from the four towns have taken place, while limited deliveries of food and medical aid were permitted three times this year.